Not long after Surak’s death, his Analects were disguised as ship manifests to prevent their destruction. Although Surak had gained many followers by the end of his life, there were still those who found his teachings a threat to their way of life. The script of the Kir’Shara, the artifact believed to contain the Analects in their original form, has been identified as Dzhaleyl. It was a writing system developed by traders who sailed the Voroth Sea from the city-state of Dzhaleyl. The earliest examples of the script are preserved in the red clay of the Na’ri Valley. The Varith Tablet, dating back over 8,000 years, is the oldest find to date. Images from the excavation are expected to be released by the Vulcan Science Academy in a few months and will be posted here when available. Five hundred years before the birth of Surak, the Dzhaleyl script was still in use but had moved from the cumbersome clay medium to scroll with the invention of dun, a paper-like material made from the fibers of the dun-yar plant, much like papyrus. It was on such scrolls that the Analects were preserved in Traditional Golic Vulcan (TGV). At the time, TGV served as a universal language in the way Latin did on Earth for over a millennium. The Dzhaleyl script – sometimes spelled Jaleyl in Federation Standard English (FSE) – consists of twenty-four glyphs. Like the Hebrew of Earth, the script originally contained only consonants, with vowels and the glyph for heh/eh (and) added sometime after the year 100. According to an ancient primer used to teach the young sons of merchant-sailors, the script — to aid memory — was designed to resemble Vulcan plant-life. Although the flora throughout Vulcan is restricted to small cacti and succulents, the temperate Dzhaleyl Region is known for its vines and creepers. The carnivorous d’mallu is particularly aggressive there. Written on consecutive vertical lines or stringers, the script is read top to bottom, right to left. Glyphs often flow into one another, although in some hands, spaces are left between words. In others, the text continues without a break, although paragraphs are always started on a fresh line. There is no punctuation. In keeping with the botanical theme of the script, the vertical line is commonly referred to as the kas-fek or stem. The top horizontal, which heads each line, is the gel (branch). The sinuous curves of the S, K, H, G, Z, C, L, R, F and V glyphs suggest a kas-elakh or vine and the semi-circular form of M and N stylized mor (leaf). The nei-savas (berry) can be seen in the A, O, and U glyphs and the kastik-og-lum (thorn) in E, I, and Y. The B and P glyphs are thought to represent buds and W the svai or mature bloom. The T glyph is a delicate tendril curling up from the branch of the glyph it precedes or follows. The glyphs in this chart are arranged according to FSE custom – as individual symbols read left to right – to make it easier for the learner to distinguish them. For Vulcan children, they are presented in the customary vertical strings. 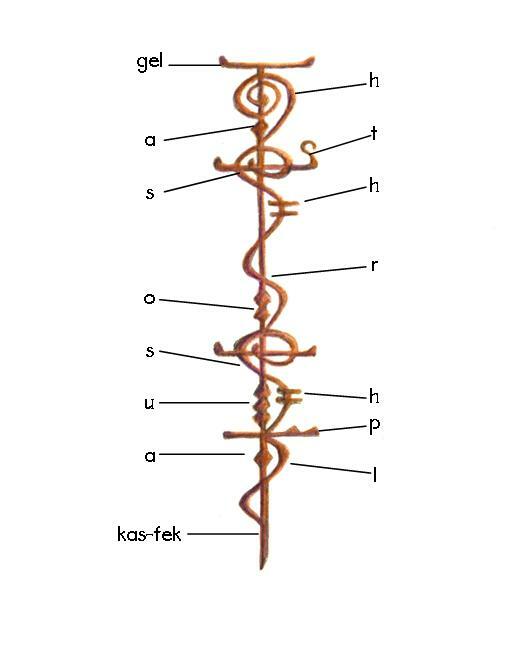 Here the glyphs are shown in relation to the gel, the head of the line. If a glyph – such as those for S, K, W, M, N, T, B, and P – incorporate the gel, then it must always be written with a horizontal line. The rest of the glyphs do not incorporate the gel and are shown here below it. Vowels are placed within the sinuous curves of vine glyphs. The H glyph (hla’meth) is only used at the start or end of a word. Where it serves to denote aspirated consonants, as in kh, ch, th, or zh, the hla’meth-nei (hla’meth seed) is used, which is recognizable in the example at the right as a double line intersecting the S glyph. To date, Shi’Oren t’Ek’Iyula-Visak’a T’Khasi – the Vulcan Academy of Cultural Heritage – had not released a Dzhaleyl font for use with Terran computer systems, but since interest in the ancient script is growing, the Academy will likely do so. At that point, a more detailed analysis, along with practical usage, will be appropriate. In the meantime, since curiosity runs strong among humans, here is a listing of the glyphs and the translations of their common names. Logically, they are plant species. an herb1; a bushy, grey-green creeper with a sweet resinous aroma that reminds some of lavender. Its oils are used in teas and soaps. an herb2; a pungent creeper with a refreshing, minty aroma. Its fresh leaves are used in teas and baths. a flowering plant with tiny white blossoms3; a desert succulent, growing in dense globular clusters. Its flesh is used as a source of water by travelers. an herb4; tall with deep crimson spiky flowers. The leaves make a resinous, citrus-scented tea not unlike bee balm. a grain-bearing grass; a staple in the Vulcan food supply6. The tips of the grass blades dry and curl in late season, making it an excellent choice for dried arrangements. an herb7; its olive-green tendrils invade crevices and affix themselves to the smoothest stone. a berry bush8 producing small, brownish-green buds which are crushed to make the beverage known as Vulcan mocha. The spiral of the glyph can be seen on the tips of the berries. rust-plant; a tall, tree-like cactus with a growth of rust-colored wooly hairs. The abundant pollen from its golden blooms resembles rust. an herb10 with a leggy growth habit and long, narrow leaves. The leaves when crushed remind Terrans of lemon and are used for tea and salads. a legume12 used in soups; has a nutty flavor. weed13; the generic term for a weed or nuisance plant, but even weeds are utilized on Vulcan. If threatening more desirable plants, weed species are carefully removed and encouraged to grow elsewhere or immediately used for their various benefits. a large, carnivorous plant.16 Although the glyph looks nothing like the dangerous, sprawling creeper, folklore explains that the glyph represents the plant after the Vulcan child had successfully dealt with it during kahs-wan. a bush that grows nowhere else but the temple that bears its name. It provides soft fibers for the weaving of fine cloths on handlooms17 and nut-like edible seed-berries. finger-plant; a cactus-like plant this is columnar at first but produces finger-like shoots – usually five in number. The tender nodules of the shoots are edible. crop(s)18 This glyph was likely inspired by hirat, a grapelike fruit – a common export of Dzhaleyl. breath-plant; a pungent herb used to ease breathing and congestion, especially in cases of lung-lock fever. The fresh leaves are also chopped and used with dried fruit in the baking of krei’la. a berry bush19, gnarled and tiny-leaved20 with thorns. grass21; an invasive species that when disturbed produces stinging nettles. 1Bonanno, M. W. (1985). Dwellers in the crucible. New York: Pocket Books, p. 5. 3Gardner, M. R. & The Vulcan Language Institute. (2011). The Vulcan Language. Raleigh, NC: Lulu Enterprises, Inc., p. 58. 4Bonanno, M. W. (1985). Dwellers in the crucible. New York: Pocket Books, p. 5. 5 Michael Sussman (Writer), & Allan Kroeker (Director). (2004). Home [Television series episode]. In Star Trek: Enterprise. Hollywood, CA: Paramount Pictures. 6Duane, D. (1988). Spock’s world. New York: Pocket Books, p. 118. 7Bonanno, M. W. (1985). Dwellers in the crucible. New York: Pocket Books, p. 5. 8The way of kolinahr: the Vulcans. (1998). Culver City, CA: Last Unicorn Games, p. 45. 9Duane, D. (1988). Spock’s world. New York: Pocket Books, p. 127. 10Bonanno, M. W. (1985). Dwellers in the crucible. New York: Pocket Books, p. 5. 11Crispin, A.C. (1994). Sarek. New York: Pocket Books, p. 89. 12 Gardner, M. R. & The Vulcan Language Institute. (2011). The Vulcan Language. Raleigh, NC: Lulu Enterprises, Inc., p. 21. 15Gardner, M. R. & The Vulcan Language Institute. (2011). The Vulcan Language. Raleigh, NC: Lulu Enterprises, Inc., p. 40. 17Bonanno, M.W. (2010). Unspoken truth. New York: Pocket Books. 18 Gardner, M. R. & The Vulcan Language Institute. (2011). The Vulcan Language. Raleigh, NC: Lulu Enterprises, Inc., p. 55. 19Martin, M.A. (2009). The Romulan War: Beneath the raptor’s wing. New York: Pocket Books, p. 71. 20Fontana, D.C. (1989). Vulcan’s glory. New York: Pocket Books, p. 10. 21 Gardner, M. R. & The Vulcan Language Institute. (2011). The Vulcan Language. Raleigh, NC: Lulu Enterprises, Inc., p. 59. This entry was posted in Archaeology, Language, Traditions and tagged Dzhaleyl script, Kir'Shara, Star Trek, Vulcan language, Vulcan literature. Bookmark the permalink. This is a wonderful article. I enjoyed reading it and learning more about this language’s etymology. The plant-like script is unique and pleasant to see. I liked reading about the types of flora. Va’sem-rik. I’bek-tor nash-veh weht t’kitaya-li-fal fna’Dzhaleyl. Nam-tor nash danaya ro’fori-bosh ovsoting. Wa’itaren n’vuhrgwaya eh sanu — fator’voh saven-tor pa’nash-torektra. Kuv kup gol-tor nash-veh na’opul’es-sak – dungi shetau nash-veh shemp-rivlidalsu. Wa’itaren, oBriht’uhn. Dungi sarlah kitaya-li-fal s’ha’gel-tanaf t’razhilan. Dungi is-tor nash-veh oZun gol-tor fereik-tor bikuv. I’vun-provulau tu kitau Dzhaleyl. Dungi kilko-tor deshkerlar. Thank you for posting such a unique script,as well as the various edible plant life analogous to Earth. I am gratified that you find the script pleasing. I’ll post some additional information about the Dzhaleyl script in a photo essay sometime this summer. I’m finding the plants descriptions you’ve provided informative as well. I can see a correlation between Ti’Valka’ain and Terran flora. If you want,I can list them in a posting. Sanoi — feim’voh kastiklar t’T’Khasi.